We are on our way to Anchorage and have a 3 hour layover at ORD. I wanted to share my love of Chicago and their fine cuisine. I had a Chicago Dog for lunch and I wanted to recommend it. It’s been said this dog has been drug through the garden and I tend to agree. 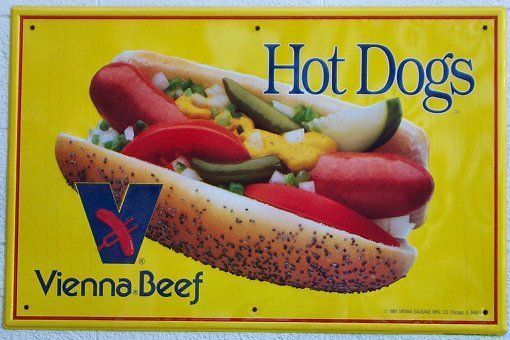 The dog begins with a Vienna Beef hot dog on a poppyseed bun; condiments include tomatoes, onions, yellow mustard, sport peppers, bright green relish, dill pickle spear and topped with celery salt. If this all sounds like a bit much, I understand. I only marginally like half of the things included, but somehow it all works together. You don’t have to be in Chicago to enjoy this hot dog, though it is preferred. Visit your local dog shop and try it out! This entry was posted in Food & Drink and tagged chicago, hot dog, vienna. Bookmark the permalink.